When children leave and their profiles are removed from your service, they are added to the centre’s Removed children page. 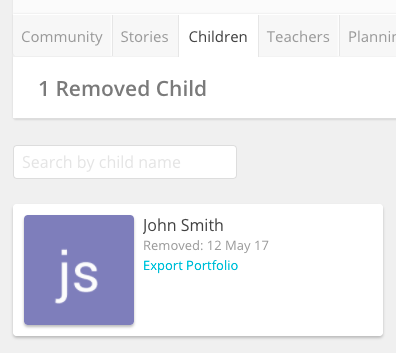 From here you can search for removed children by name, and export each child's portfolio (stories and notes). Many services want to keep a copy of each child's portfolio when they leave. The ability to keep children's digital portfolios on hand, even after they've left your service means you don't have to export and print their portfolio when a child leaves, potentially saving you money on printing. Children will appear on this page as long as their parents maintain their Storypark profile. If a child's profile is deleted, then they will disappear and you will be sent an email letting you know you have seven days to download the child's portfolio before it is deleted from Storypark completely. Removed children can be accessed from your service's Children page (you cannot access this area from within a room). Simply tap 'Removed' to view any children that have left your service. If you have a lot of removed children you can start typing their name in the search box to quickly find who you're looking for. Under a child's name tap 'Export Portfolio', and you'll be sent an email with a download link in it. After clicking the link in the email, downloading should start automatically. See this article for more information on how to access downloaded portfolios on different systems.